A heavy artillery exchange occurred last week between Hamas and Israeli military forces along the Gaza border, leading to a ceasefire brokered by Egypt. 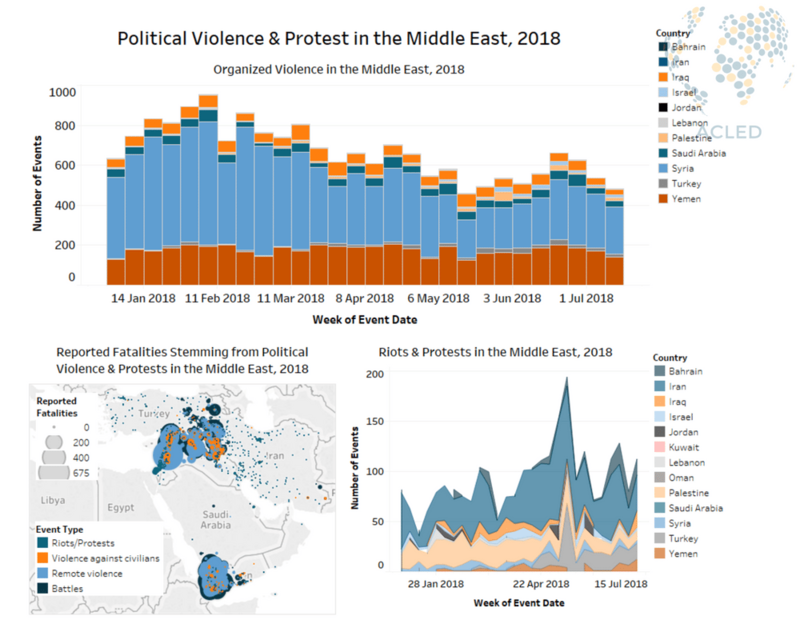 In Iraq, anti-regime protests in Basrah and Thi-Qar governorates escalated in scale and violence, spreading to other areas of the country including the capital Baghdad. In Yemen, UAE-backed and Saudi-led soldiers fought with Houthi militiamen in the Hudaydah and Sadah governorates, while a rare clash between the local Islamic State (IS) and Al-Qaeda factions occurred in Al-Qassim governorate. In another rare event, IS militants opened fire at a military checkpoint in the Al-Qassim governorate of Saudi Arabia, the group’s first reported attack in the country so far this year. Lastly, regime and allied forces in Syria gained control of Dar’a city and its surrounding area following a withdrawal agreement with rebel and Islamic factions. Elsewhere in the country fighting continued, especially in Quneitra governorate, the northeast of the country, and in Aleppo. Along the Gaza border, a two day exchange of rocket fire by both Hamas and the Israeli military reportedly left two Palestinians dead in Gaza city on July 14th. The Israeli rocket barrage itself is being considered one of the largest (if not the largest) since the 2014 conflict. Later on the 14th, a ceasefire was brokered by Egypt between the two sides, although it is unclear whether it will hold (NY Post, July 14, 2018). Over the past few weeks, incendiary kites and balloons launched by Palestinians from the Gaza Strip have sparked fires throughout southern Israel, which, whether endorsed by Hamas or not, have added to the rising tension between the two nations. This tension continues to be evidenced by violent demonstrations throughout the Palestinian territories. In Iraq, protests in relation to the deteriorating service sector, particularly in regards to electricity, water and security escalated last week in Basrah and Thi-Qar governorates, becoming more frequent and violent following the death of a demonstrator during clashes with security forces in Basrah city on July 8th. The Iraqi government declared a state of emergency as the protest demonstrations spread to Baghdad on July 13th, and attacks on government facilities became more frequent. This wave of riots and attacks on government facilities comes as the sense of frustration with the regime over corruption and limited representation has reached a boiling point following the parliamentary elections in May 2018. In Yemen last week, fighting raged between UAE-backed Giants Brigade soldiers and Houthi militiamen as the former moved to take strategic positions around Zabid town, Hudaydah governorate. Further battles were fought between Saudi-led coalition-backed troops and Houthi militiamen along the Saudi border and into several districts in the northern parts of Sadah governorate. In a rare event, IS gunmen attacked Al-Qaeda in the Arabian Peninsula (AQAP) fighters in Yakhla valley, Al-Baydha governorate, causing fatalities. AQAP fighters retaliated by attacking the IS headquarters, likewise causing fatalities. Additionally, a high number of protests were held across the country as protesters both denounced the detainment of a woman in Al-Jawf governorate by coalition-backed troops and pressured the Saudi-led coalition to withdraw some troops and military equipment from the Mahra governorate. In Saudi Arabia, IS gunmen opened fire at soldiers stationed in a checkpoint located in the Al-Qassim governorate, killing a security officer and a Bangladeshi expatriate. Security forces returned fire, reportedly killing two IS gunmen and wounding a third. Meanwhile in Syria, following the implementation of withdrawal agreements with rebel and Islamist factions in Dar’a governorate, regime and allied forces gained control of Dar’a city as well as at least 16 towns and villages in the western countryside and several posts along the Jordanian border. These advances resulted in the regime gaining control of the majority of the governorate but also in the meeting of frontlines between the regime and IS-affiliated Khalid Ibn al Walid Army in the Yarmouk Basin area. As regime forces advanced westward towards the Quneitra governorate, they engaged in clashes against Khalid Ibn Al Walid fighters during which the latter carried out a deadly mid-week suicide attack, killing at least 36 regime and allied fighters. Also in Quneitra, Israeli Military Forces shelled and carried out airstrikes on regime, Hezbollah, and pro-regime militia positions across the governorate, and reportedly shot down a drone as it approached the Israeli-occupied Golan Heights. Suspected Israeli rockets also struck Iranian and pro-regime militia positions at the Tiyas Military Air Base in the Homs desert, resulting in the destruction of military equipment and an unknown number of fatalities. In northeast Syria, Syrian Democratic Forces and regime forces continued their offensives against IS fighters and Global Coalition Against Daesh jets reportedly killed over 30 regime and allied militia fighters in Hajin, Deir-ez-Zor. Sporadic clashes were also reported in northern Aleppo between regime forces and rebel and Islamist factions, backed by Turkish military forces. Turkish warplanes carried out several airstrikes in the Afrin region of north Aleppo, the first Turkish strikes to target the area since early May 2018.